My favorite orchids from our our time on the mountain. 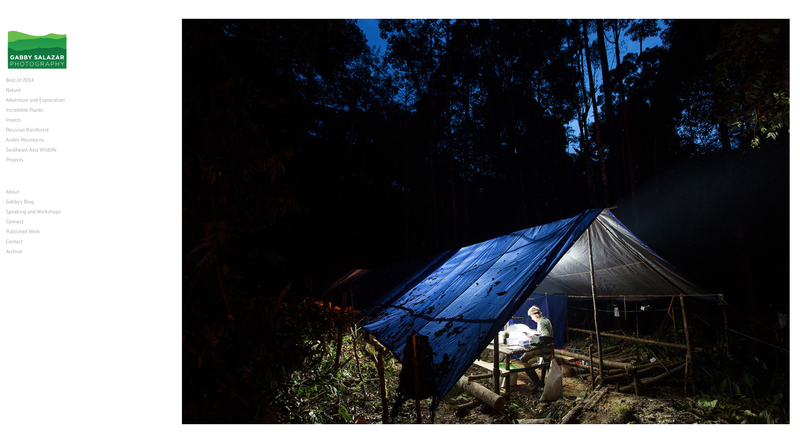 While Rick and I usually prefer exploring the forest on our own, there are some definite advantages to working with a team of researchers and guides. For me, the main advantage is that there are more eyes and ears out there finding interesting things. One of the researchers, Maria Febe, goes out everyday with one of the guides to work on vegetation plots. For these plots, she mainly counts saplings and trees, identifies tree species, and takes a series of measurements. 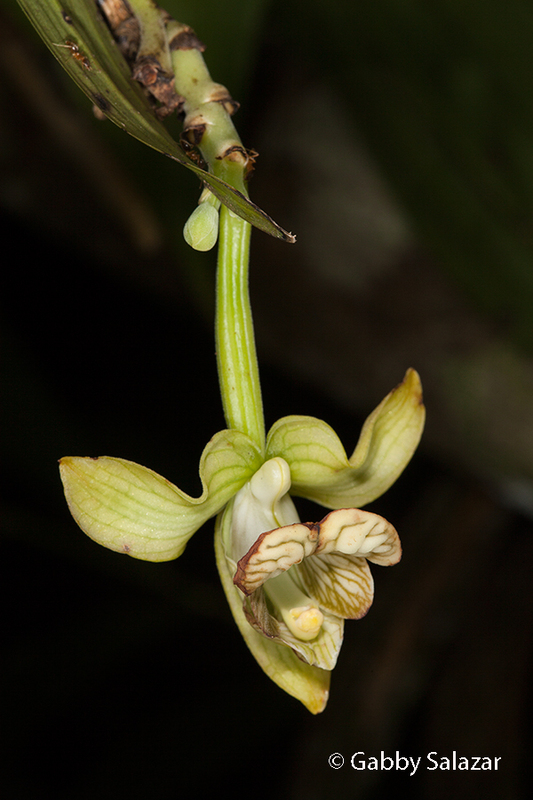 She also notes every species of orchid or pitcher plant that she finds. In the evenings, Fabe shows me photos of any of the orchids she found and last night she shared a photo that inspired me to hike halfway up the mountain today. Armed with instructions on where to find the orchid (walk around 100 meters past the second clearing and look to the left at eye level), Rick and I set off this morning. On our ascent, we were continually distracted from our goal of finding the orchid. 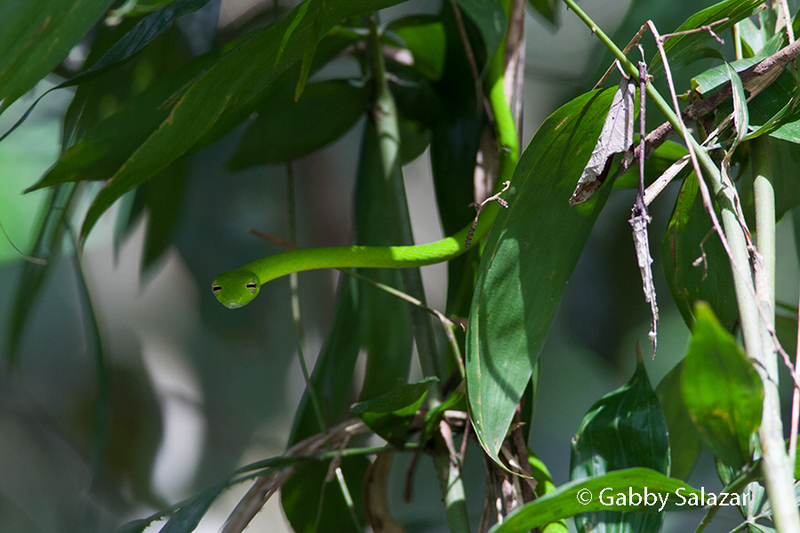 First, I spotted a green vine snake that glowed brilliantly in the sun on a bush next to the trail. The snake would normally be very camouflaged because of its thin, green body, but the light caught it in such a way that it appeared to be glowing. We spent some time filming and photographing the snake as it wound its way around a series of bushes, slinking across the vegetation. It must have been four feet long if stretched out, but it always appeared to be smaller because it was so thin and coiled. After the snake, we came across a few of the famous gliding lizards, which leave me in awe each time I see them. While they look brown and nondescript, they sport dazzlingly colored dewlaps (folds of skin that come out from their throat) and colorful wings they extend when gliding through the trees. Rick saw one of the lizards glide at least 50 feet between trees. Excitingly, a few days before, Rick had collected a specimen of one of the lizards. Rick has a strong aversion to killing things and found the lizard half-dead when he interrupted a snake in the middle of eating it. We took the lizard to Tim and he cannot find it in any of the guides. The genus is Draco and it has been suggested that we should name it Draco malfoy if it is a new species. Fingers crossed. We ran into Tim a little while later and he decided to join us on our hike up the mountain. Thankfully, the hike was a lot easier for me today than it has been, which must mean that I am adjusting to carrying my backpack and hiking up such steep terrain. 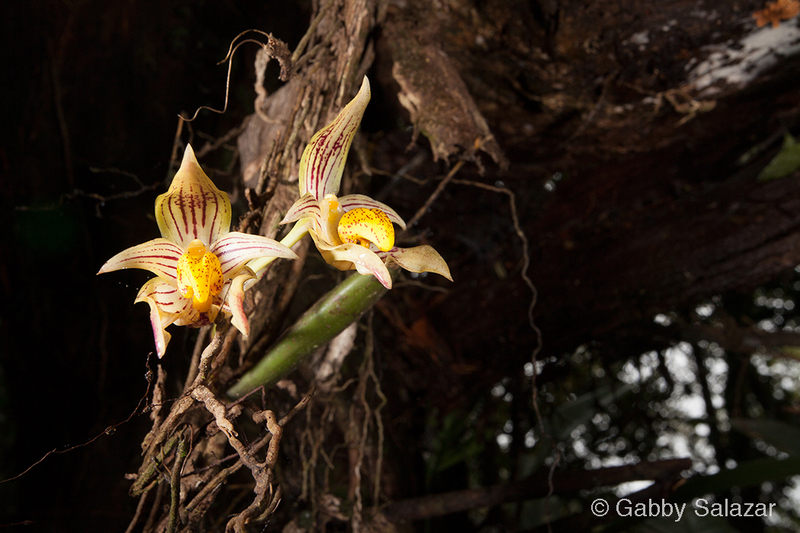 We reached 800 meters and began a careful search for the orchid. Tim ran up ahead and was unsuccessful at finding it, but I insisted on looking more closely since we had some so far. Finally, I found an orchid plant on a nearby tree and turned over every leaf until I found the single bloom that Fabe had described. It was too windy to photograph it in natural light, so I used a macro flash to photograph the flower. The orchid Febe gave us directions to find. Walking down to meet up with Rick and Tim, I paused on a particularly difficult part of the trail (essentially a mudslide) when two Dayak men approached me. They offered their hands to me in greeting, which I interpreted as an offer to help with my balance. This ended in one of the men being awkwardly pulled down when I shifted my weight onto him. We later learned that the men were hiking to the Summit and would spend the night there to hold a small ceremony. Tim decided to jet ahead to our camp while Rick and I hiked slowly down the mountain. Although the orchid and the vine snake had both been wonderful sightings, the most spectacular thing we ended up seeing all day was an insect we found on our way down. 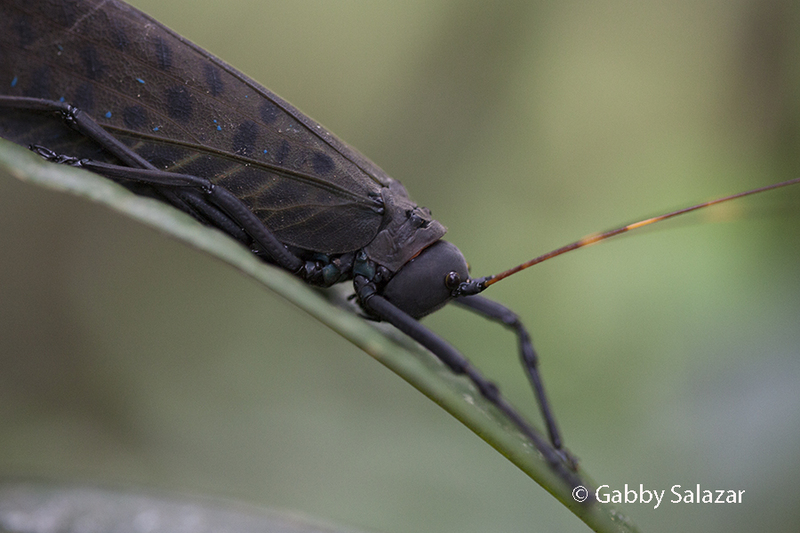 While walking slowly, I spotted a grayish black katydid sitting on a leaf. Rick and I leaned in closer to inspect it and were astonished when we saw a giant red band with two horns inflate around its neck. 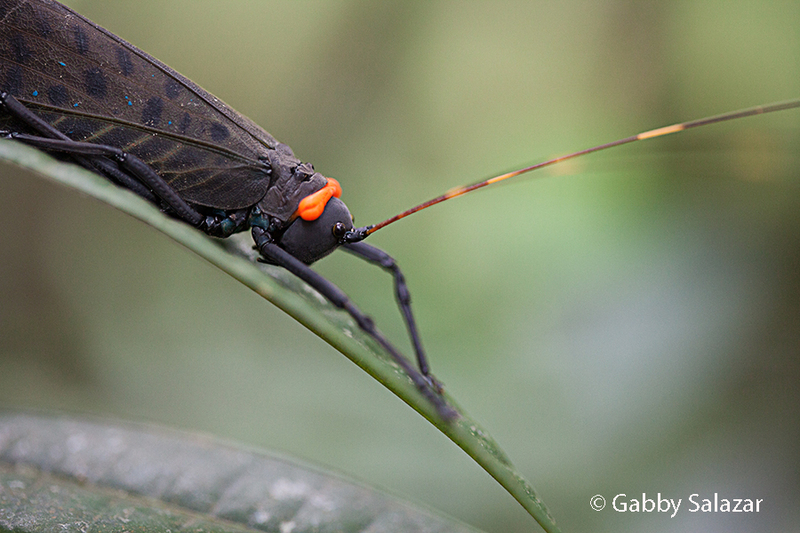 After a few moments, the katydid hid the red band entirely between its head and its body, but it would puff it out as soon as we waved our hands. We spent a long time filming this interesting behavior and were reminded that it is always worth looking more closely at even the most nondescript creatures. Katydid with red pouch puffed out. Katydid with red pouch tucked in. totally gorgeous photos! How cool, I hope you did discover a new species!! Draco malfoy sounds perfect.